As a proud Armenian, I have always been conscience of the Armenian Genocide and as a rule, made sure to try and educate non-Armenians about the Genocide. When the 100th anniversary of the Genocide was upon us, this sense of need to educate others about the Genocide was heightened and has never left my soul. What created this change in me? I think it was due to the outpouring of articles, artwork, storytelling, and musical compositions pertaining to the Genocide. Never in my lifetime had I experienced so “much” about the Genocide. It was overwhelming. New books, film documentaries and music flooded our lives. One might say it is sad that it took such a monumental anniversary date to bring out the creativities within the Armenian people. However, I say “thank God” for all of the creativity we have seen and continue to see within the Armenian creative community. The 100th anniversary has touched many of our lives. One such person is Dan Yessian. In my opinion, a creative genius. A proud Armenian that is passionate about his ancestral history, his family and having the desire to express his love, compassion and respect for the 1.5 million Armenians that lost their lives by the hands of the Turkish government. 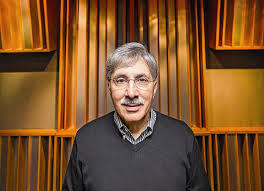 Dan is an award winning composer that has created a world-renowned recording studio for the motion picture, advertising and television industries. This time around, he composed from his heart and soul and has created a composition that will be his lasting tribute as well his legacy towards preserving Armenian history. An Armenian Trilogy is a musical reflection on the Armenian Genocide composed by Dan Yessian. Written in three movements (The Freedom, The Fear, The Faith), the music is captivating and could fit into any motion picture about the Armenian people. I told him the music was have fit nicely in the recent release of The Promise. Dan will realize a dream of having this performed by the Armenian Philharmonic Orchestra in Yerevan, Armenia this October. Congratulations to him for such an achievement! “‘An Armenian Trilogy'” is my humble way of helping to restore the memory of these lost souls. It’s my hope that this composition promotes tolerance by conveying the emotions felt by the victims of these human tragedies and that you, as a listener, find yourself empathizing with all people despite our petty differences”. said Yessian. This entry was posted in Armenian, armenian genocide, detroit, music, Uncategorized. Bookmark the permalink.